This 58 Sedan Bridge is in BRISTOL condition! This vessel is maintained with an open checkbook. United Yacht Sales New Jersey would love to guide you through a personal showing of this 58' Sea Ray 58 Sedan Bridge 2006. 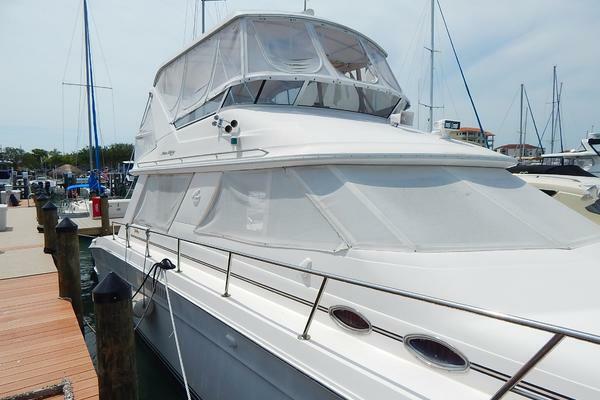 This yacht for sale is located in Jupiter, Florida and priced at $574,900. For a showing please contact us by filling out the form on this page and we will get back to you shortly! Main engines A-1 service: October 2016 remove/clean port & stbd intercooler/charge air coolers, charge air pipes, turbo compressor housings, heat exchanger pipe clusters, gear coolers and fuel coolers. Replace valve caps on expansion tanks & fill with new coolant. Generator service: replace oil, oil filter, fuel filters, impeller and zinc. Test run.Gear service: Replace oil, oil filters and zincs.